This is not being discussed at all. The Architects just now meeting in Chicago are talking circles around it. The Aeon Building (Amoco) in Chicago is of the same construction. The only other one in the world. I agree with the conspiracy theories, but it is unlikely that there was a "controlled demolition" involved in the collapse. It would have happened exactly the way that it proceded. I got very upset at the collapse of the WTC, because I don't think it should have happened. The following is extracted from a contemporaneous series of emails. I am finally starting to see some details of the wreck in newspaper photographs. I see one piece after another of the sets of beams (always three box beams 30 feet long, with three flat plates holding them together), and never twisted metal, shear marks, other metal failures -- but always the clean even tops and bottoms on the box beams, made me think this whole building was put together like leggos. Only the cross plates show breaks at the edges, next to the line of rivets or bolts. These three by three sections are in fact what the exterior wall were made of - each section staggered with the next. And on the flat plates are still the brackets which held up the floor pans - looks like maybe three feet high, with a piece coming out at a right angle on the bottom, but only a foot wide. I don't know how these were fastened to the cross plates, but I saw them missing -- in fact, most are missing -- leaving behind only a mark on the cross plate. Anyway, here are the original emails.. I have been glued to the TV on the back porch steps for 5 days. And I have been sick. Those people should not have died. They got crushed because those WTC buildings were death traps, but the engineers ain't gonna talk about that. The tube design with no intermediate supports guaranteed that the whole structure would fall into the tube. Live loads are impossible to calculate, so normally CEs multiply the shear calculations by 3X or 5X, depending on building use. But all those buildings should have gutted out the floors that were on fire, and the rest should have remained standing - even the floors above the impact. Building 7 collapsed from the bottom, because of fires on the first floor. That means that no floor could support the impact of a single floor above it. The other building collapsed as soon as the steel bent out and lost strength, but then all the floors cascaded down one after another, each loosening the floor below from its outer supports, which were probably just the pans tacked to brackets projecting from the outer shell. That means each floor had its support removed as soon as it got hit by the concrete of the floor above it. The floors are just 4 inches of concrete poured into a steel pan supported by rebar trusses. Rebars are soft steel, which have very little strength. The pans and trusses were hung from the steel of the outer shell, and supported at the service shafts. But the floors loosened, when they should not have. Looking at the pictures of the collapse you realize that it does not accelerate as it goes down. That means that each floor loosened from its end supports one at a time. And watch that dust cloud: it does not rise up, it drops - which means that it is heavy particulate matter, probably crushed concrete. That shell steel must have been barely insulated or badly flocked. The Empire State building was hit by a B47 in 1945, which put an 18 by 12 foot hole into the structure, and after the fire they just bricked it up. The construction there is steel in brick and concrete. All the engineers quoted in the media say, yes, it was the fire, not the impact that brought down the buildings, but they fail to point out that those floors should not have loosened. I think the collapse of building 7 is the most impressive indication of something being totally wrong. You can see video of fifty stories just sinking down below the tops of nearby buildings. But the fire - even if it engulfed the whole building - should have gutted it, not collapsed it. So if you have any questions about the integrity of a building, check the lobby, and count the support columns. The WTC didn't have _any_ except for posts at the elevator and service shafts. "Yikes. The only thing I heard about this was that steel softens at 800oF, whereas jet fuel burns at 1400oF. So, even if stuff gave out, you're saying that the tops of the building should have just fallen over, and the rest should have stayed? Eek. that's right. But "jet fuel" is kerosine, used for its high BTU capacity. The temperature near the ceiling was probably 1500 degrees F. See my saved file by [Arthur Scheuerman] retired NYFD Battalion Chief. A story: somebody leaving the 2nd tower, holding open the stairway door for his employees, just as the second plane hit the second tower. He saw it come in, recalls seeing the ceiling collapsing, and then slammed the door and ran. The problem is that a floor normally should be able to bear the load of the floor above it, and probably a half dozen floors. But it didn't. "Ugh. I had a feeling that the WTC attackers had gotten "lucky" when the towers fell down. They sure did - I am sure they had no concept beyond damaging and a fire. And remove that "bomb" concept. 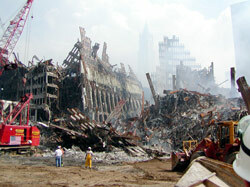 - the floors of the WTC did not blow out, excepting debris from the 500 mph impact, and, initially, dust. - then a fire started, at the windows, where oxygen was available. That means liquid kerosene was burning, not gasses from fuel. - there were fires at the WTC and the pentagon days later - probably from pooled liquid kerosene. That is what did in building 7 -- but from a local storage tank, and probably "number 2 diesel fuel". I also wonder how much fire damage really happened at the outer shell. It is possible that the steel lost its strength, but I am starting to feel this was not so. The temperature might reach 600 to 1200 degrees in a fire (gasoline from a IC engine cylinder exhausts at 1500 degrees), but it would take time. Additionally, the shell was in compression, not in shear, and compressive strength would remain despite increased temperatures. What you would get with loss of temper is the possibility of the beams bending. And once that starts it just gets worse. It looks to me that when the building collapses the outer shell peels off after floors collapse, not before. What I think happened is that as floors collapsed, they pushed against the shell. There is a photograph in the Tribune of the first collapse which shows the top section tilting over at 15 degrees as the collapse starts. Which means the top section was not even instrumental in compressing the shell beams. That it didn't "topple over" is used as another false datapoint in the syllogism of "controlled demolition." But that is absurd. The buildings are hollow. The top could probably have tilted 30 degreea and would still have come down on top of the remaining building. It's center of gravity determines if it will "topple," and the center of gravity would be at the very center of its cubic form. "Looking at the interior construction of the tower, it looks like the floors were what held the exterior to the center support towers. Even with a lot of heat, you still don't think the supports in the floor should have given way? The center was probably taken out by the plane. But _nothing_ explains the collapse of the other 96 floors except failure by shear. I also think the central service and elevator and stair shafts probably did little except provide a bearing support for the floors. They would certainly not be designed for transverse tension - that just doesn't happen to any degree in this building, even if it sways in the wind. The whole design was based on having large open spaces for offices. The WTC was about 250 feet wide. Normally you would fill that void with posts on 30 to 50 feet centers, and also outside posts. For such design the outside walls at any story provide no support, and are hung from the ceiling beams (called curtain walls). That is in fact the usual construction in modern steel buildings. 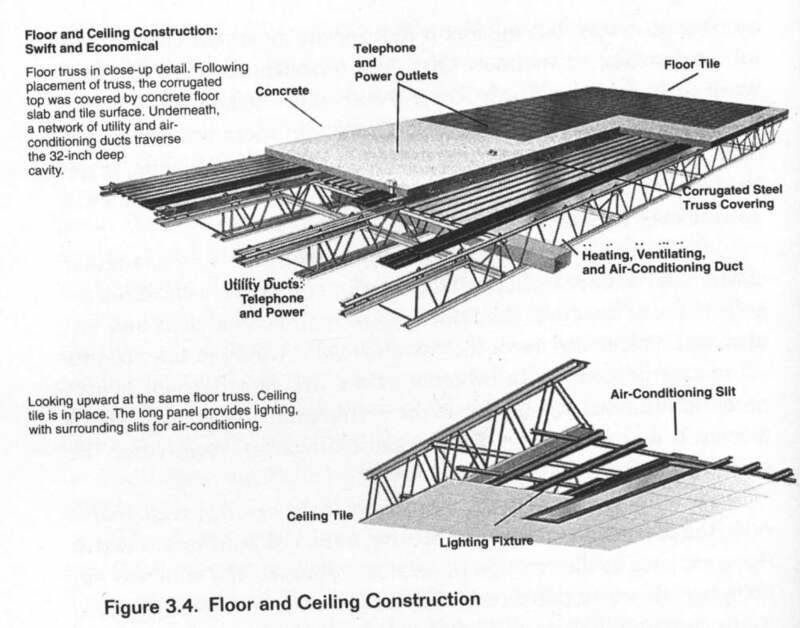 But in the WTC towers there isn't any "support" for a floor, except at the extremes of a 100 foot span with rebars (actually trusses made up of welded rebars) locked into the transverse parts of the outside shell, and the concrete posts at the service shafts. The actual floors are formed of concrete poured into metal pans, which might be tacked (welded) into the transverse beams of the outside shell. But the design is for a typical dead load, and a mild live load. Not for a karate chop. The forces in impact far exceed the "weight" of a falling item. The forces are found by finding the time it will take to equalize the momentum of the falling and fallen-upon object. It the fallen-upon object "gives" the time is extended, and the forces reduced. Like catching a falling hammer in the air. If the fallen-upon object does not give then the forces are far greater - and can be calculated from the change in acceleration. Catch that same hammer with your hand placed flat on a table! Concrete floors do not give. At the worst, you could find the force from F=Ma, that is.. 32 times the weight of the falling object. They are talking about the building "pan-caking" and that is entirely correct. A whole stack of pancakes just compressing down upon each other. I did these calculations once for some CTA proposed barriers that were to be installed on the corners of the Loop elevated. These were proposed when a train went off the loop at Wabash and Randolph. We rejected the request for State funding on the basis that the 3 foot high beams would do nothing to stop a moving train if it went off the track. That is 250,000 pounds -- for the first car -- coming at the beam at 30 miles per hour, aided by the traction of the electric motors on all two or six cars. It was difficult to estimate the impulse forces involved, but even rudimentary calculations proved the beams to be next to useless. They were to be fastened at the bottom, so that the forces would place a torque on the beam which would place the bottom fasteners in tension. Considering that the tensile strength of steel is greater than any other measure (shear would undo the fasteners in a wink), the fasteners would be subjected to 2 to 3 times the impulse forces of the impacting car. "So how should the building have been made to not collapse? On the one hand you say that the floors gave because the impact of the floor(s) above exceeded it's sheer strength, but at the same time you say that the "lower floors" should not have collapsed. What am I missing here? Intermediate support columns, cross beams, fireproofing, and x5 shear calculations. Since building the Monadnock (1891, Chicago), only 12 or 14 stories, with a base of 6 foot thick brick, no tall building is held up by its outer walls. They are all post and beam construction, like houses in the middle ages. Floors will collapse, but they will cantilever from support posts, or remain up because of cross beams. The WTC was not post and beam construction. it was a hollow tube with pancakes suspended at 11 foot intervals. If it would have had posts and cross beams the collapse would have stopped. And have you seen the WTC side walls? They are sections (looks like) of uprights and cross connections (maybe) two stories tall and maybe 6 windows wide, interlaced during installation so connections between floors are staggered. But that also means that at every floor half the uprights from below ended and were fastened to a set rising further up. Thus you have seams at every floor. It would be a great tall structure, which could sustain hurricane winds - if it remained hollow, or just had a sightseeing stairway. Then it has a central core - and what looks like a dozen columns surrounding the core, but no intermediate support columns for a span of (looks like) 100 feet for the floors. That would work fine if nothing bad ever happened. The first plane (looks like) made a small hole, it looks like its wings folded when it hit the building. (That is hard to believe.) The 767 is 200 feet between its wing tips, the building is 250, but the hole is less than half the building width. It is not like it took out the side walls. And there was an extraordinary fire, at the edges of the WTC where there was oxygen. If that weakened the outer shell and it bent out, it should have taken sections of the floor with it. But that didn't happen. The floors let go at their internal end supports everywhere, and sequentially. Those end supports were flimsy, as were the 3-foot deep hollow floors themselves. The floors below were not heated up nor was the steel failing. What failed was the end supports of the floors - all of them, one after another. And then the steel shell snapped laterally or fell into the tube as each floor slammed into the next. It is said that buildings don't collapse by falling inward like that unless a demolition team has places charges at the right locations. The thinking of us uninformed people is that the core would have to have been damaged ("blown out") with well-placed charges. But that is film-adventure fantasy. The elevator core didn't hold anything up. And the blasting-away of portions of the (massive) outer wall would not have initiated a collapse. It would only have damaged the outer walls. The compressive forces would have encircled the gaps and holes that would have been created, and all of it would have remained in place. Only by having a number of floors cascade (slamming) on each other, would a progressive collapse have been started. Since lower floors were not fire damaged, and thus did not have weakened trusses, it is the slam of each floor on the next one below which pulled the outer walls inward (to add to the compressive slam further below). The operative mechanism here is exactly what loosened the fire-damaged floors: the rivets at the floor pans loosened from the outer wall brackets. The lower floors would have pulled in the outer wall sections before also loosening. And note that all the outer wall sections shear at the overlap plates. Not a one is bent, crumpled, blown apart. It was the collapse of a lot of stacked up Leggos. Also note that the wall brackets which were meant to hold up the floors have many rivets at the three-foot vertical section, because these are in shear, but only a few at the horizontal one-foot section, where the floor pans were fastened, because these were in compression. As soon as a floor yanked an outer wall section inward, however, these rivets would also be in shear, and would have popped like coat snap. This was a disaster waiting to happen. Any good fire could have set off the cascading collapse of floors. Those 5000 people did not need to die. They were crushed out of existence. "Yikes. Okay, I think I get it finally. Ugh. I wonder if the attackers had all this in mind when they hit it?" No, I don't think so. What happened is sheer luck to them. For one thing, no-one would _expect_ that to happen. - Why did the World Trade Center buildings fall down when they did? "In the towers, the weak link was the floors. "Floor beams or trusses will heat up faster than columns, because they're thinner pieces of steel," W. Gene Corley, the leader of the FEMA team, says. The floors were supported with sixty-foot-long right angles of steel (on the long sides), and these were bolted, not welded, to the inner and outer columns. "The whole floor system was a very lightweight construction," Eduardo Kausel, a structural engineer at M.I.T., told me. "Another engineer described the floors to me as "flimsy." Jerome Connor, also of M.I.T., said, "The weakest link was definitely the connections of the floor trusses to the vertical members." Those connections were protected with the mineral-fibre spray, but most of it was probably knocked off by the impact of the airplanes. Ron Hamburger told me, "If you knock it, that spray-on protection will come off. When I visited the site, I went through the American Express and the Bankers Trust buildings, and I saw large chunks of the fireproofing in those buildings knocked off--and that was only by falling debris, not by an airplane hit. I think we can assume there was a lot of unprotected steel in the towers after the planes hit." "The columns in the core were massive, and were capable of bearing huge gravity loads, but they depended on the floors to provide lateral support. As the floors around the crash site began to give way in the intense fire, ever greater lengths of the core columns, which were already overloaded because of the destruction of exterior columns, became exposed. There is mention in Eric Darton's "Divided we stand, a biography of New York's World Trade Center," (1999) written before 9/11, about the floors sagging (up to six inches), the building swaying enough to make some people sick. The book covers the 30 year political history of the WTC and the Port Authority. For another history see the NY Times 'bestseller' book by Angus Gillespie, "Twin Towers, the life of New York City's World Trade Center" (2002), written initially before 9/11, and then updated. More pro than con. Six months later: The best analysis of the WTC has come to my attention, written by retired NYFD Battalion Chief Arthur Scheuerman. A page located at some CE site, I have mirrored it here as [http://jnocook.net/texts/wtcfire.htm]. It is by far the most reasoned analysis. I added an illustration from (I think) the NYTimes.